These enzyme-antibody conjugates can be used in applications such as: Enzyme-linked immunosorbent assays (ELISAs), Blotting techniques, In situ hybridization, Cytochemistry and Histochemistry detection systems. Contact us for Custom enzyme-antibody conjugation labeling services. Should you not find a service that suits your needs, we will find a solution for you! Our enzyme antibody conjugates are prepared by techniques that yield an approximate 1:1 ratio of enzyme to protein of interest, thus ensuring maximum retention of activity of both enzyme and protein. Since every antibody/protein has its own unique characteristics, conjugation needs to be optimized prior to the beginning of the conjugation process. Bio-Synthesis will assign a dedicated project manager to evaluate and collect the specific project scope to ensure fast, efficient and optimized antibody-enzyme conjugates. Antibody purity should be greater than 95%. Antibodies should be supplied at a minimum concentration of 5 mg/ml in a neutral buffer without preservatives, protease inhibitors or carrier proteins. If a client supplies and presents a reagent to Bio-Synthesis, proof of quality is required. If there is no proof of quality, for an additional fee, Biosynthesis can provide quality check and sample processing. Bio-Synthesis also assists in providing affinity chromatography services using the corresponding immobilized antigen or immunoglobulin binding protein. For example, protein A may be employed. For prices regarding other enzymes, fluorescent labels and hapten-carrier conjugations, or for higher volumes, please contact us for a specific quote. * Prices vary based on project specification such as specific chemistry use, type of linkers, conjugation ratio, purification, conjugation ratio and quality control. Inquire about large quantity enzyme-antibody labeling services. Choosing the best antibody enzyme conjugate for your application is not always easy. We can help you decide on the most suitable conjugate for your applications. 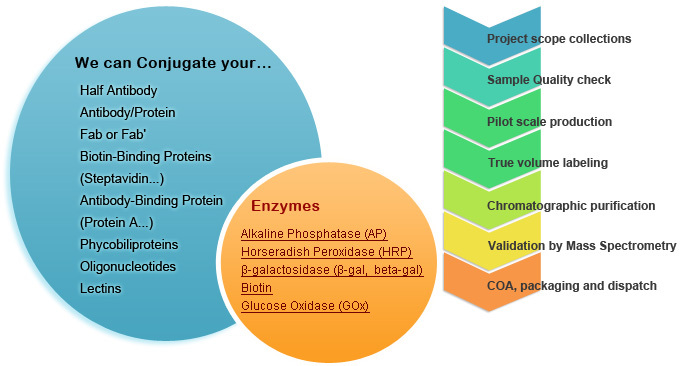 Our enzyme conjugates are prepared by techniques that yield an approximate 1:1 ratio of enzyme to protein of interest, unless otherwise specified by the customer. After standard desalting or purification, a small percent of heterogeneous products containing single or multi-site conjugate per molecule may exist. After labeling the enzyme with the cross linking reagent, final conjugates must first be isolated from excess or unreacted reagent by gel filtration or dialysis. In many cases, simple dialysis may suffice to remove unreacted reagent from the reaction solution. Additional purification techniques such as stirred cell filtration, tangential flow filtration (TFF) and gel filtration chromatography may also be used to either remove excess reagent or to isolate and characterize the cross-linked product. For reagents (mostly protein and other biological molecules) that are similar in size or larger than the antibody, one must resort to other purification techniques such as affinity chromatography, ion-exchange chromatography and hydrophobic interaction chromatography. The cross-linked target molecules may further be characterized by biochemical and biophysical techniques. Once the product has been purified, it may be subject to many different types of studies including spectroscopic (MALDI-top, ESI, LC-MS Fluorescence), electrophoresis, immunochemical biochemical and enzymatical analysis. QC (quality control) and QA (quality assurance) procedures are also followed independently to offer you double guarantee for the highest quality possible of every delivered conjugates. Moreover, our dedicated technical account managers will guide your project through every step of the process and constantly keep you informed of the latest project progress. Alkaline phosphatase (AP) is a hydrolase enzyme that is frequently conjugated to antibodies for use in immunoassays. AP has a lower catalytic rate than HRP but has greater stability and maintains linear reaction kinetics for much longer. PNPP is a popular colorimetric substrate for AP; the product of the reaction, p-nitrophenol can be read at 405nM. Fluorogenic substrates (e.g. 4-methylumbelliferyl phosphate; MUP) may also be employed. Horseradish peroxidase (HRP) has been used as a colorimetric marker in the area of Antibody-Based Antigen Detection Assays, ELISAs, Westerns Blots, and Immunohistochemistry. It may be either directly conjugated to the antibody of interest or linked to a secondary antibody of interest. Secondary conjugates are often employed to target a species specific antibody of interest (e.g., mouse, rabbit, goat, etc.). This method may save the researcher precious time in conjugation, however secondary antibodies have their drawbacks. Secondary antibodies are known to significantly increase background signal through non-specific binding to antibody/antigen surface. For producing maximum specificity, with high signal to noise, it is always best to use direct primary antibody conjugates. Procedure: After a buffer exchange (if necessary), labeling of mAbs with the cross-linking reagent followed by gel filtration to remove excess crosslinking reagents. Then react activated antibody with Beta-galactosidase. Final conjugate will be dialyzed into a Tris based buffer and filtered. Finally, a stabilizer is added to the final B-Galactosidase conjugate. Procedure: After a buffer exchange (if necessary), labeling of mAbs with the cross-linking reagent followed by gel filtration to remove excess crosslinking reagents. Then react activated antibody with Beta-galactosidase. Final conjugate will be purified by SEC Chromatography, QC by gel electrophoresis, chromatography and activity check using ONPG in excel of 600 units/mgs. Final conjugates are store in a Tris based buffer and filtered. Finally, stabilizer is added to the final B-Galactosidase conjugate. Option 3: This service includes option 2 with extensive purification and quality control. The attachment of biotin to biomolecules is an important laboratory technique. Biotin binds to the tetrameric avidin proteins, including streptavidin and neutravidin, with exceptionally high affinity. This interaction is exploited in various applications such as western Blots, and, immunohistochemistry and ELISA. Supplied antibody will be labeled with a long spacer arm biotin derivative, followed by an appropriate purification method. The final average ratio of antibody to biotin will be determined by performing HABA biotin quantification assay. Glucose oxidase (GOx) is an enzyme produced and purified from Aspergillus niger, which catalyzes the oxidation of glucose with the release of hydrogen peroxide. Its molecular weight is 80kDa, but it exists as a dimer of 160kDa. Measurement of glucose by GOx is used in the food industry, in fermentation and most importantly, as the basis of biosensors for the diagnosis of diabetes.